Sun., Jan. 20, 2019, 5:28 p.m.
Arike Ogunbowale scored 24 points and No. 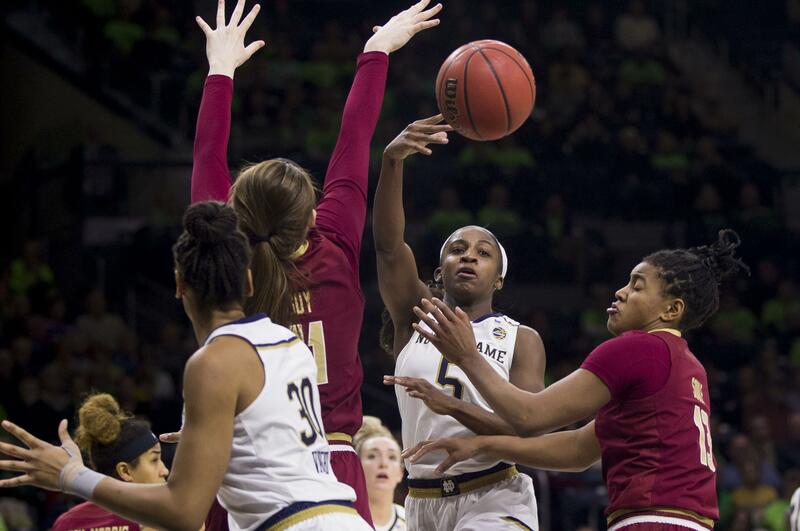 1 Notre Dame beat Boston College 92-63 on Sunday in South Bend, Indiana, for its 11th straight win. Jackie Young had 18 points, 13 rebounds, four assists and three steals for the Fighting Irish (18-1, 6-0 Atlantic Coast Conference). Jessica Shepard added 11 points, 10 rebounds and six assists. Freshman Taylor Soule scored 18 points for Boston College (13-6, 2-4). NO. 2 BAYLOR 79, WEST VIRGINIA 47: Kalani Brown scored 17 points and Baylor beat West Virginia in Waco, Texas. The Lady Bears (15-1, 5-0 Big 12) shot 50 percent from the floor, including 58 percent in a dominant first half. Juicy Landrum and Lauren Cox both had 13 points. Tynice Martin had 18 points for West Virginia (12-5, 3-3). NO. 4 LOUISVILLE 73, WAKE FOREST 49: Arica Carter scored 12 points, Bionca Dunham had 10 and Louisville used 3-point shooting and trapping defense beat Wake Forest in Winston-Salem, North Carolina. The Cardinals (17-1, 5-1 Atlantic Coast Conference) broke it open with a 10-0 run in the second quarter, held off a brief Demon Deacons response and were in command the entire second half. Louisville made 10 of 25 3-point shots and forced 26 turnovers. Ivana Raca led Wake Forest (9-9, 0-5) with 11 points. NO. 5 OREGON 93, ARIZONA 60: Sabrina Ionescu posted her NCAA-record 16th career triple-double, finishing with 21 points, 12 rebounds and 12 assists in Oregon’s victory over Arizona in Eugene, Oregon. Satou Sabally scored 18 of her 25 points in the first quarter to help Oregon (17-1, 6-0 Pac-12) win its 10th consecutive game. Oregon scored the game’s first 20 points and led 31-4 after one quarter. Aari McDonald had 20 points for Arizona (13-5, 3-4). NO. 6 STANFORD 85, WASHINGTON STATE 64: Hall of Fame coach Tara VanDerveer reached 900th victories in 33 seasons at Stanford in the Cardinal’s victory over Washington State in Stanford, California. Alanna Smith had a career-high 34 points to help Stanford (16-1, 6-0 Pac-12) get its 20th straight home victory. VanDerveer became the third Division I women’s coach to reach 900 victories at one school, joining late Tennessee coach Pat Summitt and UConn’s Geno Auriemma. Cherilyn Molina had 18 points for Washington State (7-11, 2-5). NO. 8 N.C. STATE 70, VIRGINIA TECH 61, OT: Kiara Leslie scored 25 points and Aislinn Konig made a go-ahead 3-pointer in overtime and No. 8 North Carolina State remained undefeated, topping the Hokies in Raleigh, North Carolina. Konig made five 3s and scored 20 points. N.C. State (18-0, 5-0 Atlantic Coast Conference is the lone undefeated Division I team in the nation. Trinity Baptise had 13 points for Virginia Tech (13-5, 0-5). NO. 9 MARYLAND 79, PENN STATE 67: Taylor Mikesell scored 23 points, Kaila Charles added 19 and Maryland used a strong finish to beat Penn State in College Park, Maryland. Shakira Austin had 13 points and 10 rebounds for the Terrapins (16-2, 5-2 Big Ten). Teniya Page scored 20 for Penn State (9-9, 2-5). NO. 19 ARIZONA STATE 79, NO. 10 OREGON STATE 76, 2OT: Kianna Ibis had 28 points, 13 rebounds and three blocks and visiting Arizona State handed Oregon State its first Pac-12 loss. Reili Richardson added 16 points, including nine in the overtime periods, and made three of four free throws down the stretch for the Sun Devils (13-5, 4-3). Mikayla Pivec had 19 points, nine rebounds and seven assists for the Beavers (15-3, 5-1). GEORGIA TECH 65, NO. 12 SYRACUSE 55: At Atlanta, Kierra Fletcher scored 22 points, including 10 straight for Georgia Tech in a game-closing 17-3 run. Elizabeth Balogun added 20 points for Georgia Tech (13-6, 3-3 Atlantic Coast Conference). Miranda Drummond had 15 points for Syracuse (14-3, 3-1). The Orange had won nine in a row. NO. 14 MARQUETTE 83, ST. JOHN’S 73: Natisha Hiedeman scored 23 points and had a career-high seven steals to help Marquette beat St. John’s in Milwaukee. Danielle King made all 13 of her free throws and had 22 points, and Erika Davenport added 20 points and 16 rebounds for the Golden Eagles (16-3, 7-0 Big East). Marguette made 19 of 21 throws in the fourth quarter. Curteeona Brelove had 22 points for St. John’s (8-10, 1-6). NO. 20 RUTGERS 76, NO. 17 MICHIGAN STATE 62: Stasha Carey scored a career-high 30 points and Rutgers beat visiting Michigan State for its 10th straight victory. Arella Guirantes added 19 points for Rutgers (15-3, 7-0 Big Ten). Taryn McCutcheon and Sidney Cooks each had 15 points for Michigan State (13-5, 3-4). NO. 22 IOWA 94, ILLINOIS 75: Megan Gustafson had 27 points and 12 rebounds for her 17th double-double in 18 games this season and Iowa rolled past Illinois in Champaign, Illinois. Gustafson made all eight of her field-goal attempts in the first half and scored 17 points to help Iowa (14-4, 5-2 Big Ten) take a 55-45 lead. Brandi Beasley scored 21 points for Illinois (9-9, 1-6). SETON HALL 84, NO. 24 DEPAUL 73: Shadeen Samuels had 18 points and nine rebounds to help Seton Hall beat DePaul in Chicago. Inja Butina, Nicole Jimenez and Desiree Elmore added 15 points apiece for Seton Hall (12-6, 4-3 Big East). Ashton Millender had five 3-pointers and 18 points for DePaul (13-6, 4-3). PURDUE 56, NO. 25 INDIANA 53: At West Lafayette, Indiana, Kayana Traylor scored a career-high 15 points and Karissa McLaughlin added 14, including a go-ahead jumper and two free throws in the final half-minute, for Purdue. The Boilermakers (14-6, 5-2 Big Ten), who beat the Hoosiers (15-4, 4-3) for the first time in four meetings. Bendu Yeaney scored 15 points for Indiana. Published: Jan. 20, 2019, 5:28 p.m.